Its been nearly two weeks since my rainbow started school. Rollercoaster of emotions for both of us. I was so proud the very first day, she was so excited to be going to school. Parents were allowed to take the children into the classroom for the first two weeks to settle them in. She couldn’t wait for the gate to open and she ran straight in and did a happy squeal when she saw her class teacher and she said hello rainbow. We found her new peg, she was excited that it has a caterpillar on it. Then went into the classroom to put her book bag in the right place and settled her on the carpet ready to start her new school life. She gave me a kiss and said bye quite happily. I was ok, not has emotional as I thought I would be, but think that was because she went in so happy. Also think it helped that I was at work. At the end of the first day she came running out and gave me the biggest cuddle ever. Full of smiles. Second day went actually the same, maybe because it was all still a novelty? 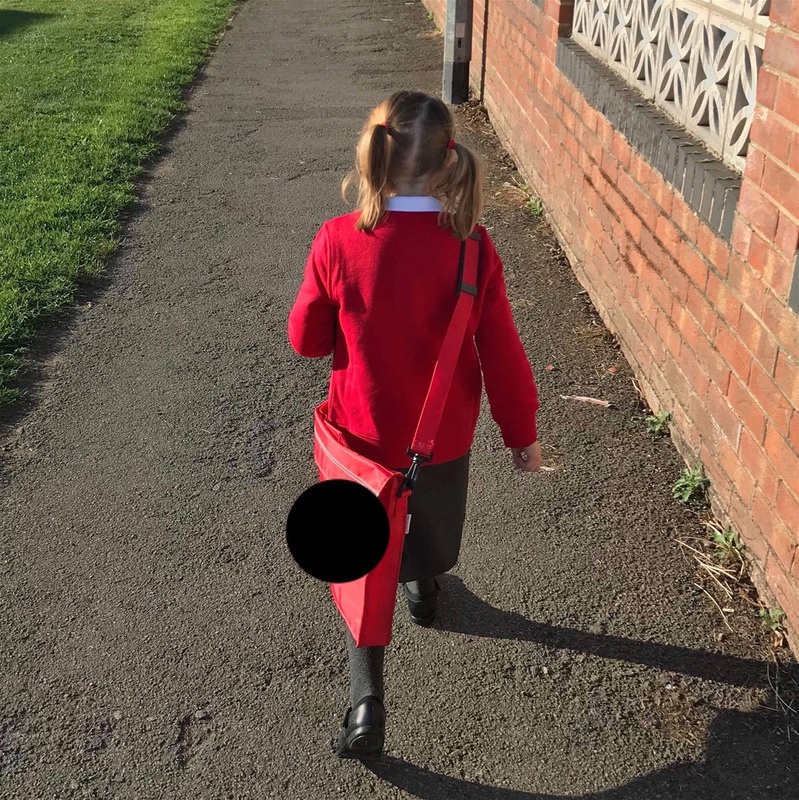 Monday 10th September marked the start of Rainbow's second week at school and also her first full week. Today I was back to my new hours at work so she was in breakfast and after school club on a Monday. At the preschool she's been going to for a year. Same ladies and building but we had tears when I left her, literally the lady had to peel Rainbow off me. Which was emotionally for me, knowing I wouldn’t see her again for nearly 10 hours. Apparently she soon settled and was happy when she got picked up by my partner. She was absolutely fine all week then , apart from been a little tired come Friday. It's a hard life going to school everyday. By Monday 17th September the novelty had truly worn off and I was greeted by saying such as "not school again"
Has Rainbow goes to breakfast club on a Monday, today which is Tuesday 18th September was the first day that I actually had to drop Rainbow off at the school gate rather than walking her into the classroom. I has mention it several time before to let her know what was happening. She found some of her new friends in the playground and it was lovely to see her happily playing and laughing. Then the bell rung and it was time to go in. I explained that Mummy was waiting here at the gate, kissed her goodbye and she started walking in. Suddenly she stop and started crying, she turned round and that’s when my heart felt like it was breaking. The emotions, I just wanted to scoop her up in my arms and hug her so tightly. But couldn’t, I kept my emotions to myself waved and said" its ok I love you, see you later." She walked in to the classroom full of tears. I went home, my first day off since she started school. And cried my eyes out.